Manufacturers Index - Lane Manufacturing Co.
Montpelier, VT; Barre, VT, U.S.A.
Lane Manufacturing Co. was best known for its sawmills and was established about 1868, although their current incarnation indicates that they have been making sawmills since 1848. Lane was in business until 2004. At that time they sold out to Meadows Mills, Inc. of North Wilkesboro, NC, and the operations were moved to that city. The company was established by Dennis Lane, Gen. Perly P. Pitkin, and James W. Brock under the name of Lane, Pitkin & Brock. The name change to Lane Manufacturing Co. seems to have happened in about 1874. 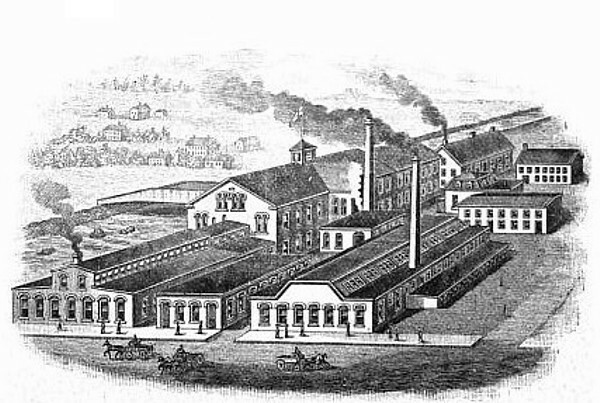 Lane Manufacturing Co. became a very large and successful manufacturer of sawmills, waterwheels, derricks, cranes, and granite-working machinery. In 1900 they had about 600 employees in Montpelier. The Lane shingle mill was particularly successful and that design was licensed to the Lloyd Manufacturing Co. of Kentville, Nova Scotia, for the Canadian market. In later years the business operated as Lane Equipment Co. and Lanetech, both in Barre, VT. Poor business conditions led those firms to be sold to Meadows Mills, Inc. in 2004. Mentioned in 1874, 1876 Manufacturer & Builder ; ads in 1875 Manufacturer & Builder . Listed in a work published by the United States Centennial Commission, Official Catalog of the 1876 International Exhibition : "Lane Manufacturing Co., Montpelier, Vt. Portable single circular saw mill, designed for common us as a portable sawmill, and also intended for use in fixed establishments of ordinary capacity. Sawyer sets the log, uprights both receded, and when desired, advanced by power. dogging devices, especially for 'live' or 'through and through' sawing, or for holding frozen logs. Gauge roll (Fairbanks' patent); tapering devices, elevated scale or rule. Over 2,000 of these mills (Lane's patent) in use. Heavy double circular saw mill, intended for first-class establishments of the highest capacity; 72 inch lower saw and 40 inch upper saw, feed and jigging back works, operated from either front or back side of frame; saw-guide quickly removable; uprights advanced by both forward and backward motions of lever; setter rides on carriage; rolled-steel headblocks; improved dogs catch under and upper sides of logs, and swing away from saw when released; uprights receded or advanced by power. ( Saw Mill Building ); 24 inch traveling-bed or "Farrar," planing machine; 18 inch stationary bed or roll-feed planing machine; heavy matching, or tongueing and grooving machine; light matching, or tongueing and grooving machine." 1885 circular of 40 pages, entitled, "Descriptive circular of Lane's patent lever-set circular saw-mills and saw-mill set-works, manufactured exclusively by Lane Manufacturing Co., Montpelier, Vermont (formerly Lane, Pitkin & Brock.)" The 28 February 1897 issue of "Northeastern Lumberman and Manufacturers' Gazette" has an ad for Lane Manufacturing Co. The ad lists "Woodworking machinery. Specialties: Lane's patent lever set circular saw mill. Saw mill set works. Clapboard machinery. Shingle machinery. Lath machinery. Swing saws. Planing machines. Matching machines." The November, 1898 issue of The New England magazine says that this company was "established some thirty years ago by Gen. P. P. Pitkin, Dennis Lane, and James W. Brock, and first did business as a partnership under the name of Lane, Pitkin & Brock." 1902 catalog of 76 pages, with title similar to that of the 1885 catalog. A shingle-sawing machine with a 19 Feb 1878 patent date (corresponding to patent number 200,546) on it is labeled with both "Lane Manufacturing Co." and "S. C. Forsaith & Co." names. It was probably made by Lane - who was assigned the patent - and retailed by Forsaith. The U. S. Forest Products Laboratory published a booklet dated March 1936, Operating small sawmills, methods, bibliography, and sources of equipment by C. J. Telford. A table lists the makers of various types of equipment, including circular sawmills, band sawmills, edgers, and planers. This company was listed as a maker of circular sawmills and edgers. Bruce Mitton, who was an installer and troubleshooter for Lane Manufacturing for nearly 20 tractor mill), (#1), (Green Mountain), as well as automatic mills and various other pieces of mill equipment. In 2004, due to a business slump and declining sales, Lane sold out to Meadows Machinery Co., another mill manufacturer about as old as Lane... At the turn of the century, the Lane Co. was quite a going concern, employing some 600 men in Montpelier, VT., making just about any sort of woodworking or graniteworking machinery, Quarry derricks, overhead cranes (10, 20, & 40 ton), even turbine wheels for water-powered sawmills." The Meadows Mills, Inc. website provides this information on Lane: "On July 8, 2004 Meadows Mills, Inc. completed the purchase of Lane Equipment Company and Lanetech of Barre, Vermont. Lane sawmills have been manufactured since 1848." The Lane Sawmill line was sold by Meadows Mills to Bornemann and Greene of Morrisville, Vt in 2006. Bornemann and Greene was a full service welding and machine shop that also provided millwright services and owned the drawings and patterns for Chase sawmills. Bornemann and Greene then sold to LWI Metalworks of Morrisville, Vt. in 2008. LWI does not fabricate new mills, but they do provide parts and service for Chase and Lane mills.